Sometimes it can be done right. Alabama has used golf and retirement as the engine to drive the creation of a tourist brand and provide a burgeoning economic stimulus that would make any government envious. This all changed when Alabama married golf and retirement in an entirely different way with the creation of the Robert Trent Jones or RTJ Golf Trail. The CEO of Retirement Systems of Alabama, Dr. David Bronner had a clear and ingenious vision in the late 1980’s. In an attempt to diversify the pension fund for state employees he proposed investing millions to develop and manage a series of golf resorts throughout the state. Not only was this meant to provide a steady return for the fund, but also to attract visitors and create a brand or identity that would raise the profile of Alabama to a world-class golf and tourist destination. The result is a resounding success and perfect example of how a government agency can get it right when entrusted to manage the money of its residents. Since 1992, Alabama tourism revenues have increased in excess of 7 billion annually, with much of this attributed to the more than 500 000 yearly rounds of golf on RTJ Trail courses. 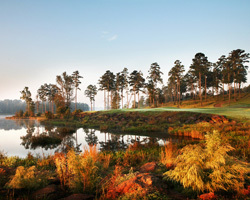 With its many regions Alabama and the RTJ Golf Trail provide a diverse collection of golfing retreats. The southern stretch of Alabama enjoys the splendors of The Gulf Coast and all that comes with it. The northern expanses are rugged, crossed by the Appalachians, creating deep valleys surrounded by sharp, dramatic, sheer-faced ridges. The central plains are reminiscent of a rolling forested oasis, scattered by rivers and wetland marshes. This varied topography in Alabama provides for many unique properties each with its own character and feel. The courses too are as varied as the land they sit upon. Mother Nature should at least be co-credited as an architect of record as Robert Trent Jones used what he was given to the fullest extent. Forming a partnership with legendary course architect and trail namesake, Robert Trent Jones, what began with the opening of 2 facilities in 1992, has become the foremost golf trail anywhere and the benchmark to which all others must be compared. 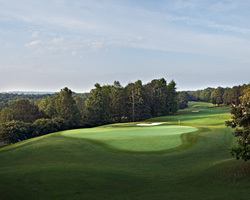 With 11 public access facilities spread throughout the state, providing 26 courses and 468 holes, there is no shortage of variety, challenge and unique experiences to be had. With green fees peaking at $64 at all resorts except at Ross Bridge, the value is second to none. Quite frankly, if you can’t find something for your golfing tastes here, perhaps you should think about giving up the game. My personal piece of the Trail experience took me to 4 of the 11 facilities, a 5 day 7 round whirlwind that challenged and impressed. 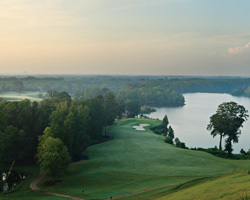 Robert Trent Jones Golf Trail at Oxmoor Valley: One of the original RTJ facilities built on reclaimed land once owned by US Steel is now a 54-hole facility featuring an 18 hole short course and two distinctively different championship courses, The Valley and The Ridge. The Valley starts and finishes with dramatic elevation changes, but in between the golfer is presented with a series of holes that are framed with ponds, rivers and water crosses. The first and eighteenth holes are worth the green fee alone. The Ridge is a perfect name for this layout. Holes that run along and across the natural ridges put a premium on shot making more than power. With dramatic elevation changes your approaches need to allow for lots of up or down. Signature hole four brilliantly incorporates exposed shale both fronting and backing the elevated green site. 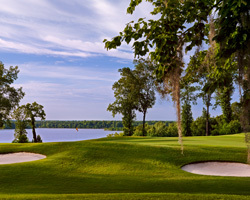 Robert Trent Jones Golf Trail at Capitol Hill: Located on a bluff overlooking both the Alabama River and Montgomery, the capital of the state, this facility presents 54 holes of championship golf. Home to an LPGA event at the Senator and the Judge being continually rated as one of the most challenging public golf experiences anywhere, Capitol Hill is a must on any visit to the Trail. Complimented with a stay at either the luxurious Renaissance Montgomery Hotel & Spa or the on-site Marriot Prattville hotel, your stay will be unforgettable. The Senator is home to the Navistar LPGA Classic. This classic links-style layout features windswept fairways, dramatic mounding, deep fescue grass and a multitude of pot bunkers. 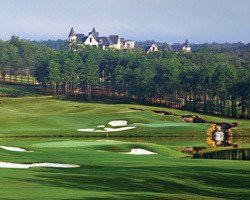 A formidable challenge with yardages between 5100 and 7700 yards, see what the pros face by taking a run at the Senator. The Judge is rated as one of the toughest courses on the Trail if not the planet. 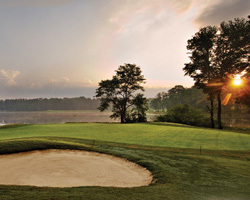 The Judge begins with a spectacular opening tee-shot off the dramatic precipice of the bluff down to the river’s edge. It continues along and over large watercourses, before climbing back to the hilltop at the finishing hole fronted by a waterfall. Stretching to 7800 yards, be careful to play the right set of tees for your ability, as this “Judge” can be unforgiving. The Legislator begins and ends with a series of links holes and blends in parkland and water holes incorporating a piece of both the Judge and Senator in its design. With its many different landscapes the Legislator has a little of everything, beautiful vistas, dramatic elevation changes and narrow fairways requiring precision. 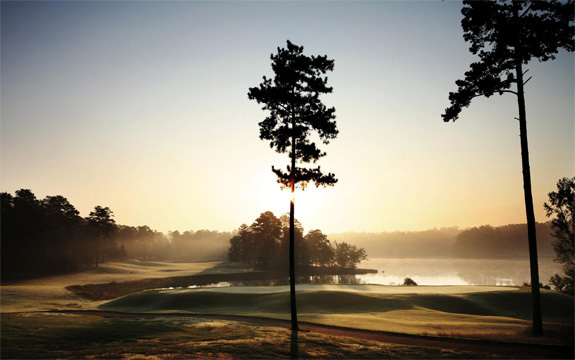 Robert Trent Jones Golf Trail at Grand National: With a beautiful 600 acre lake as the centerpiece of the complex, Jones has created a magnificent collection of holes that are continually considered as some of the best public access golf anywhere. As the area’s premier resort facility in combination with the Auburn Marriot Opelika Hotel and Conference Center, it is difficult to disagree with any of the accolades bestowed on the complex. A short course and two championship courses, The Lake and The Links are quite likely the crown jewels for the entire Trail. 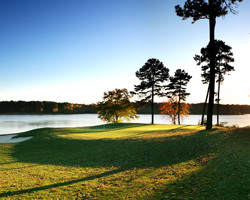 The Lake has 12 holes creatively hugging the shoreline but not placing undue stress on your game. However, it is easily debated that some of the best holes are the inland ones, featuring stark elevation changes and tree-framed fairways. The stretch of holes 14 - 16 are as good as it gets, testing precision, club selection and your nerves. The Links is a design of pure genius. Blending striking beauty, formidable shot demands and a whole lot of fun, this isn’t just a must play, but an absolute. This eclectic collection of holes is capped with a fantastic finish to a raised, elongated green fronted by jagged rocks and water and the backdrop of the charming clubhouse overlooking. 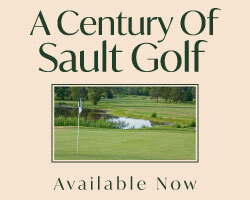 It is a culmination to one of the best golf experiences you will ever have. Robert Trent Jones Golf Trail at Ross Bridge: Located in Hoover in the beautiful Shannon Valley and surrounded by large mountain ridges, the setting of this community and resort is visually striking. The Trail’s showcase facility features a brute of a course surrounding the magnificent Renaissance Resort and Spa, designed in theme of the Banff Springs Hotel. With pools waterslide, volleyball, biking, tennis and a variety of on-site dining choices, park the car, relax and soak up the old world charm. Ross Bridge is the newest and grandest complex in the Trail’s stable. This 8200 yard beast features generous fairways, sharp fall-offs and lightning fast greens. Home to Regions Charity Classic, a PGA Champions Tour event, this layout is a perfect ocation for those looking for a stadium golf experience. The appropriate tee-decks are a must here as you want to enjoy this course for its shot making and not be overburdened with 250 yard forced carries. 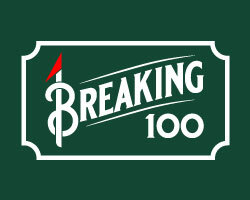 Much fun can be had as you envision yourself with the galleries and golf’s past champions. Who knew that the vision of an astute pension fund CEO would be the guiding force in the creation of one of the most remarkable collections of public golf facilities in the world? Indeed there are those rare opportunities when government gets it right, the Robert Trent Jones Golf trail is one of those. For those seeking a destination of unmistakable value look no further than the tidewaters, forested hills and stark ridges of Alabama as your locale. 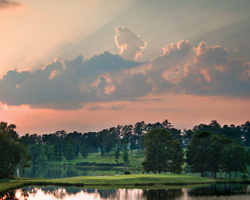 Whether looking for a full-trail golfing extravaganza or a quick-hitter junket, Alabama’s Robert Trent Jones Golf Trail will provide all the beauty and challenge you could ever imagine. If it is your first trip to Alabama, don’t count on it being your last.